TrivikramFlowtech provides fluid handling solutions for all kinds of Process industry needs. 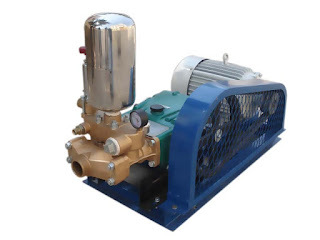 With over two decades of history,We are one of the largest Industrial pump distributors in India.TFT pumps represents leading pump manufacturers in the world, we technically connect Industries with Pump manufacturers. Pumps may be classified on the basis of the applications they serve, the materials from which they are constructed, the liquids they handle, and even their orientation in space. All such classifications, however, are limited in scope and tend to substantially overlap each other.A more basic system of classification,first defines the principle by which energy is added to the fluid, goes on to identify the means by which this principle is implemented, and finally delineates specific geometries commonly employed. This system is therefore related to the pump itself and is unrelated to any consideration external to the pump or even to the materials from which it may be constructed. (1) Kinetic/Rotodynamic,in which energy is continuously added to increase the fluid velocities within the machine to values greater than those occurring at the discharge so subsequent velocity reduction within or beyond the pump produces a pressure increase. (2)Positive Displacement, in which energy is periodically added by application of force to one or more movable boundaries of any desired number of enclosed, fluid-containing volumes, resulting in a direct increase in pressure up to the value required to move the fluid through valves or ports into the discharge line. Kinetic pumps can be further classified as centrifugal,mixed flow and axial.Positive displacement pumps can be further classified as reciprocating,blow case and rotary. Kinetic pumps generate pressure hydrodynamically by using impellers which shift fluid by momentum,rather than positive mechanical travel.They are appropriate for high volume requirements of numerous industrial processes,especially the centrifugal type. Single-stage,single-entry pumps are adequate for lower capacity applications,and for higher duties the single stage.double entry type of pump is favoured for higher efficiency. In cases where the pressure is required at a higher degree than that of a single-stage centrifugal pump,a 2-stage pump using 2 impellers can be used. 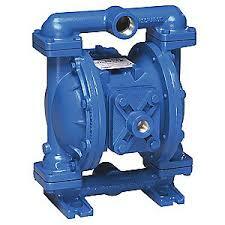 Pumps with more than 2 stages are usually referred to as multi-stage pumps. 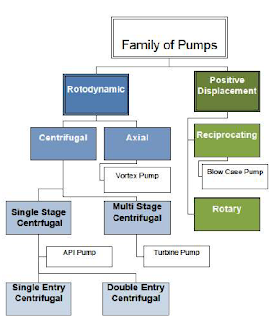 In some unique cases,where high pressure requirements are needed.pumps can have more than 8 stages.It is common for multi-stage machines to have radially by reciprocating or rotary action. 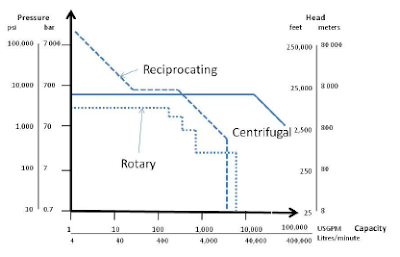 A centrifugal pump is a rotodynamic pump that uses a rotating impeller to increase the pressure and flow rate of a fluid . Centrifugal pump are most common type of pump used to move liquids through a piping system. The fluid enters the pump impeller along or near to the rotating axis and it is accelerated by the impeller, flowing radially outward or axially into a diffuser or volute chamber, from where it exits into the downstream piping system. 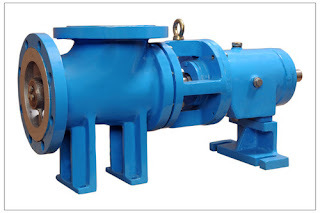 Centrifugal pump are typically used for large discharge through smaller heads. 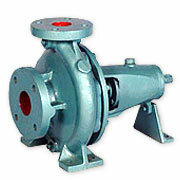 Centrifugal pump are often associated with the radial-flow type. However, the term "centrifugal pump" can be used to describe all impeller type rotodynamic pumps including the radial, axial and mixed-flow variations. 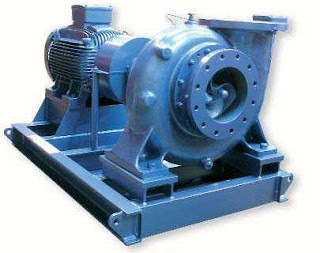 Axial-flow pump differ from radial-flow pump in that the fluid enters and exits along the same direction parallel to the rotating shaft. The fluid is not accelerated but instead "lifted" by the action of the impeller. 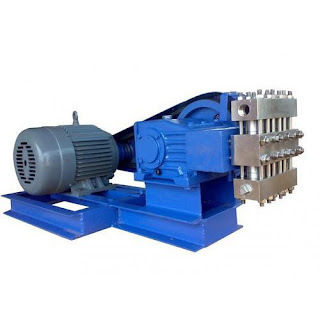 Axial-flow pump operate at lower pressure and higher flow rates than radial flow pump. Mixed-flow pump function as a compromise between radial and axial-flow pump. The fluid experiences both radial acceleration and lift and exits the impeller somewhere between 0 and 90 degrees from the axial direction. As a consequence mixed-flow pump operate at higher pressures than axial-flow pump while delivering higher discharge than radial-flow pump. The fluid that enters along the axial plane is accelerated by the impeller and exits at right angles to the shaft (radially). Radial-flow pump operate at higher pressures and lower flow rates than axial and mixed-flow pumps. Gear pumps - a simple type of rotary pump where the liquid is pushed between two gears. Rotary vane pumps - similar to scroll compressors, these pump have a cylindrical rotor encased in a similar shaped housing. As the rotor orbits, the vanes trap fluid between the rotor and the casing, drawing the fluid through the pump. Diaphragm pumps - similar to plunger pumps, where the plunger pressurizes hydraulic oil which is used to flex a diaphragm in the pumping cylinder. Diaphragm valves are used to pump hazardous and toxic fluids. Piston displacement pumps - usually simple devices for pumping small amounts of liquid or gel manually. 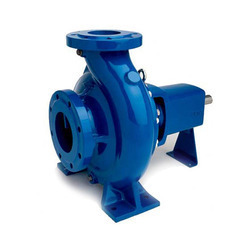 We discussed about the classification of pumps and its various types.This is just a small portion or root of the family of pumps more and more amazing new generation pumps are waiting for you. In the previous article we discussed briefly about the centrifugal pumps and its various configuraions. Now we are going to discuss a little deep about the various configurations explained in the previous article. Centrifugal pumps are a sub-class of dynamic axisymmetric work-absorbing turbo-machinery.Centrifugal pumps are used to transport fluids by the conversion of rotational kinetic energy to the hydrodynamic energy of the fluid flow. Centrifugal Pumps – Energy InputIf you were to cut a section out of the top of a pipe and use a canoe paddle to move the water, you would have a pump. It would not be very efficient, but you would be inputting energy into the water. If you reshaped the paddle into an impeller, you would be able to place more energy into the water. The energy would be transferred from the impeller to the water due to the friction between the impeller and the water. However, water would splash out onto the floor. This is because centrifugal forcecauses the water to fly outward away from the impeller.